Stands, baskets, buckets and racks! All filled with today's popular candy. There's something for everyone in these filled candy displays. PLEASINGLY SWEET DEALS! These Candy Filled Racks and Displays are designed to do the work for you, simply place on your counter and they'll make you money. Aim high with the candy stands and prefilled bucket racks. Grow more from your floor with lollipop trees and candy filled basket displays. There are numerous prefilled displays for you to choose from. Try the bucket rack filled with candy and counter top displays. 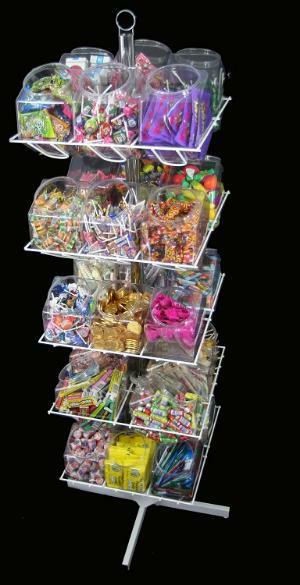 Need a large prefilled candy display? We have those too! Fill your candy store with bins, racks and candy, for less when you choose a pre-packaged candy display. Nothings easier than moving product from box to selling in your store than the candy packages you'll find here. Make work easier and start enjoying profits today with your purchase of these fully functional ready to go candy store displays!